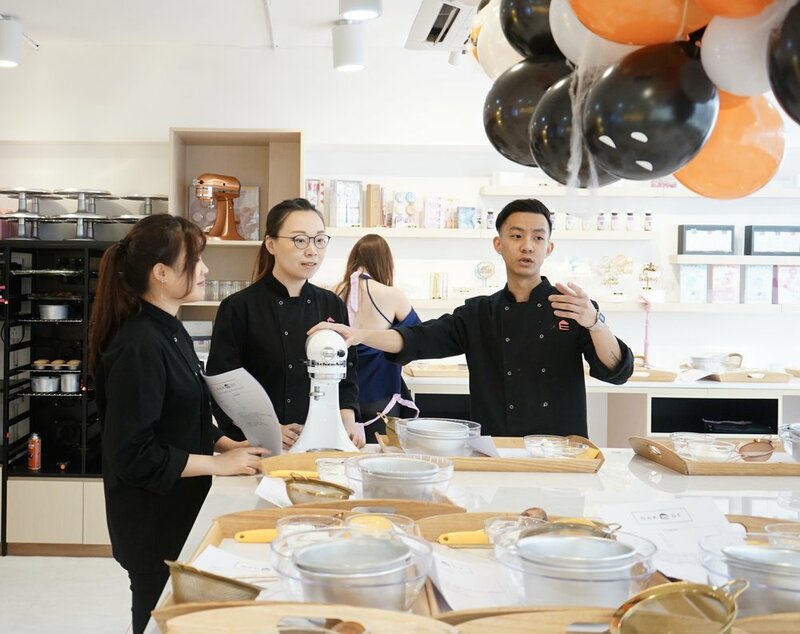 Bakebe is Hong Kong ’s First & Only Co-Baking Studio that Teaches you to Bake with an App, using modern APP technology we aim to revolutionize everyone’s baking experience! How cool is it if i tell u that you don’t need an instructor to learn how to bake. because everything u need is right here! At Bakebe, we designed a user-friendly APP with detailed instructions, graphics, videos and a step by step guide that will allow you to complete your chosen baking project from start to finish all by yourself. Nothing else is needed. All the tools and ingredients you need will be available and provided in store. 1. Waltz into our store! 2. Pick and pay your desired baking project on the spot. 3. Follow the steps in the Bakebe APP. We guarantee that you will walk out with an amazing and tasty pastry made by you! The word “be” can be whatever you wish to be in the baking world. The reward of creating something with our own two hands can’t be earned in any other way. We want to make your baking experience as fun and as stress-free as possible! Bakebe have teamed up with talented pastry chefs who have worked in Michelin starred restaurants to design the menu with us. EACH recipe is designed with precision and is foolproof. Founder of Bakebe, Venus Chi has long been accustomed to the glamour of high society and good food, from hosting tv shows related to fashion, food and cooking to being the master of ceremonies at many high-profile events and eventually becoming a professional food blogger, there aren’t many foods that haven’t crossed her palate, despite all this, the food that she enjoys the most are those that are homemade, food made with love. With this philosophy in mind, she wanted to be able to give everyone the opportunity to create something with their own hands for themselves and those they loved and thus Bakebe was born. Bakebe is built upon the simple concept that the reward of creating something with our own two hands can’t be earned in any other way, especially if we are creating something for our friends or loved ones. We chose to focus on baking as we decided that it was the most suitable product that could be both kept relatively well and also movable (plus who doesn't enjoy a little bit of sweetness once in a while… or all the time). Venus envisioned that Bakebe would be a space that allowed people to enjoy and experience the magical transformation of raw ingredients into delicious pastries with as little stress as possible, by combining the expertise of professional baking experts with the Bakebe App, Venus aims to create a learning system that will allow everyone to experience the joy of baking. Worked with world famous chefs such as Mr. Umberto Bombana at the 8 1/2 otto e mezzo bombana restaurant. All of our Bakebe experts are experienced & passionate bakers.